Low in calories, rich in protein, minerals and vitamins—sure, tofu’s good for you. But, you may ask, how good can it taste? Tofu has gotten a bad rap, and understandably so. Tofu-based products outside of Japan are often bland and uninspiring. But the variety of products and the quality of tofu available here are reasons enough to give it another chance. Tofu and other soy products come from daizu, or soybeans. Sitting down at the izakaya with a bowl of edamame is to enjoy soy in its simplest form. But there’s much more to it than these humble beans. Read on for a crash course. 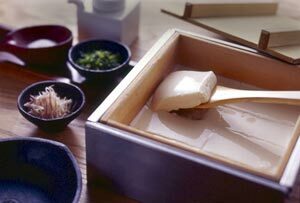 The basic block of tofu is usually either momen dofu (regular) or kinugoshi dofu (silk). The softer of the two, kinugoshi is very delicate and used primarily for soup, or for hiyayakko. Hiyayakko is simply tofu with a variety of toppings, typically grated ginger, katsuobushi (bonito flakes), thinly sliced negi (green onions) and soy sauce. You can also a variety of non-Japanese items, like olive oil, balsamic vinegar or kimchi. Momen dofu is used for tofu steak, mabo dofu (the spicy pork and tofu dish at Chinese restaurants), and most other tofu dishes. Try adding small cubes of tofu to your next salad. Yakidofu (grilled tofu) is used for sukiyaki or other hearty nabe. Deep-fried tofu has a nice hagotai (bite) to it and is easier to cook with because it’s not as delicate as other varieties. Abura-age and atsu-age are similar except that atsu-age is thicker and is not fried all the way through, leaving it soft in the middle. You’ll find abura-age on noodle dishes, such as tanuki udon, or with rice, in the slightly sweet inari zushi. It’s also a nice alternative to regular tofu in miso soup, and goes well with stir-fried vegetables. Ganmodoki are deep-fried balls of tofu mixed with grated yamaimo (yam) and other vegetables, and can be found in oden. Yuba is the delicate skin taken from soy milk and can be purchased fresh, frozen or dried. Fresh yuba can be served sashimi-style with soy sauce and wasabi. It has a creamy, rich texture to it. You’ll also find it in suimono (clear soup). Koya dofu is the “freeze-dried,” sponge-like tofu often found in nimono. Okara is the lees leftover from making soy milk and is rich in fiber. Often it will be mixed with vegetables, soy sauce, dashi and mirin. Try okara as a replacement for mashed potatoes when making potato salad or croquettes. Soy milk is trendy right now, as it’s believed to help you lose weight. You can find it at the supermarket in flavors like mattcha, royal tea and coffee. Unflavored tonyu has a rich texture, much like heavy cream. Add it to your next nabe, hearty chowder or gratin. Keep in mind that it burns easily and the soup should only be allowed to simmer. And although tonyu looks like milk, it should not be used as a substitute because it has only about one-fifth the calcium as dairy milk. Often seen sprinkled over mochi, kinako has a lovely toasted nutty flavor. It’s made from toasted soybeans that have been ground. Add a tablespoon to a glass of milk and you have a healthy, all-natural version of the diet shakes. For a wafu sundae, top vanilla ice cream with kuromitsu syrup and kinako. In the morning, try it over buttered toast with cinnamon. Your local tofu-ya may be the best place to start experimenting with soy. Every depachika will also have a tofu shop. If you’re near Tsukiji, stop by Noguchiya Tsukiji Honten (03-3544-8812) in the outer market. They are extremely friendly and have just started selling tonyu soft ice cream. Look for tofu made from locally produced soybeans, such as Noguchiya’s from Aomori-ken. Another alternative is to try a variety of dishes at a tofu restaurant. My favorite is Yamato in Ginza (03-5537-6060). Yamato has a diverse menu that’s not limited to tofu, so carnivores will be fine.